Next of Kin: Adopted son of Sarah E. Pugh, of 67, Albert Rd., New Town, Ledbury, Herefordshire. 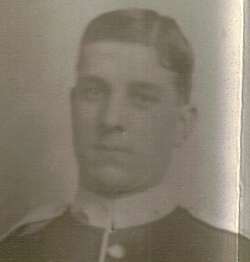 His regimental number indicated that he served with the Worcestershire Regiment as a pre-war regular solider before transferring to the MGC – and he is likely to have some connection with Samuel Wellsted Pugh, whose regimental number is nearly sequential (9385). Many of those who served in the machine-gun sections of infantry battalions were transferred (without further training in UK) to newly formed brigade machine gun companies in May 1916. It is likely therefore that he was wounded and after recuperation was stationed near Grantham for training prior to being moved back to France. He won the Military Medal for bravery on the Somme on 14th September 1916.